Faf du Plessis remained not out on 50. An all-round performance by South Africa helped them to seal the series in fifth and final one-day international played at Newlands Stadium, Cape Town on Wednesday, thanks to a superb bowling performance by South African bowlers that helped them restrict Pakistan to a modest total which the batsmen then chased down with ease. South African captain Faf du Plessis won the toss and decided to field first. 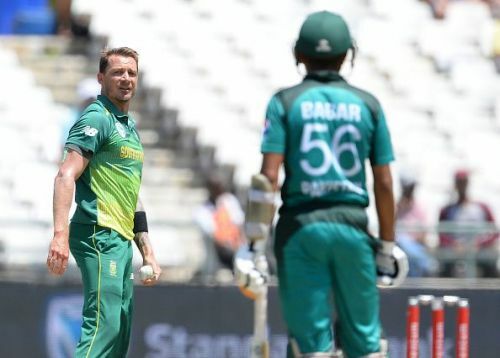 Dale Steyn got the hosts off to a perfect start as they took the wicket of Imam ul Haq for just 8 runs. Babar Azam and Fakhar Zaman played with positive intent and took on South African bowlers. Pakistan had scored 53 for 1 at the end of 10 overs. Azam and Zaman were looking good before the former was bowled around his legs by Dwaine Pretorius for 24 runs. Both of them added 56 runs for the 2nd wicket. Zaman looked in fluent touch and reached his fifty off 58 balls. Mohammad Hafeez and Zaman added 44 runs for the 3rd wicket. The latter was dismissed for 70. In next, Mohammed Rizwan struggled scoring just 10 runs off 30 balls. Shadab Khan and Imad Wasim added 21 runs for the 8th wicket. The South African bowlers kept picking wickets at regular intervals. Pakistani captain Shoaib Malik was run out for 31. Wasim played an important cameo, scoring 47 off 31 balls and kept the lower order in control. From 128 for 4, Pakistan could only score 240 for 8 in 50 overs. For South Africa, Pretorius and Andile Phehlukwayo picked 2 wickets each. Chasing the target of 241 runs to win, South African openers Quinton de Kock and Hashim Amla got the team off to a flying start adding 39 runs. Hashim Amla was dismissed for 14 runs by Shaheen Shah Afridi. De Kock looked in sensational form and took the attack to Pakistani bowling. South Africa scored 65 for 1 at the end of 10 overs. Reeza Hendricks also played some lovely strokes. De Kock reached his fifty off 42 balls. Hendricks and de Kock added 61 runs for the 2nd wicket. Hendricks made 34 off 33 balls. De Kock continued to put pressure on Pakistani bowling line up and was eventually dismissed for a superb 83 off 58 balls. De Kock and Faf du Plessis had added 46 runs for the 3rd wicket. Du Plessis and Rassie van der Dussen showed their class by effortlessly taking singles and hitting the bad balls away for boundaries. The South African captain du Plessis reached his fifty off 72 balls while van der Dussen reached his fifty off 61 balls to finish off the match. Du Plessis and van der Dussen added an unbeaten 95 runs for the 4th wicket. South Africa won the match by 7 wickets with 60 balls to spare. South Africa sealed the 5 match ODI series 3-2. South Africa 241 for 3 in 40 overs ( Quinton de Kock 83, Faf du Plessis 50*, van der Dussen 50, Shaheen Shah Afridi 1/34) beat Pakistan 240 for 8 in 50 overs ( Fakhar Zaman 70, Imad Wasim 47*, Phehlukwayo 2/42, Pretorius 2/46) by 7 wickets.